Once again the PhilNITS will be conducting sets of examination for coming this October which includes exam categories for IP, FE, and AP. The schedule of exam for IP or Level 1: Information Technology Passport Certification Exam is on October 25, 2015 which will covers Technology, Strategy & Management ( a half-day multiple choice exam).The cost of exam is P900.00. The FE or Level 2: Fundamental Information Technology Engineers Certification Exams will be on October 25, 2015 as well. Same scope of exam with IP and still whole day multiple choice exam. 2.5 hours in AM and 2.5 hours in PM with lunch break.The cost of exam is P1,800.00. 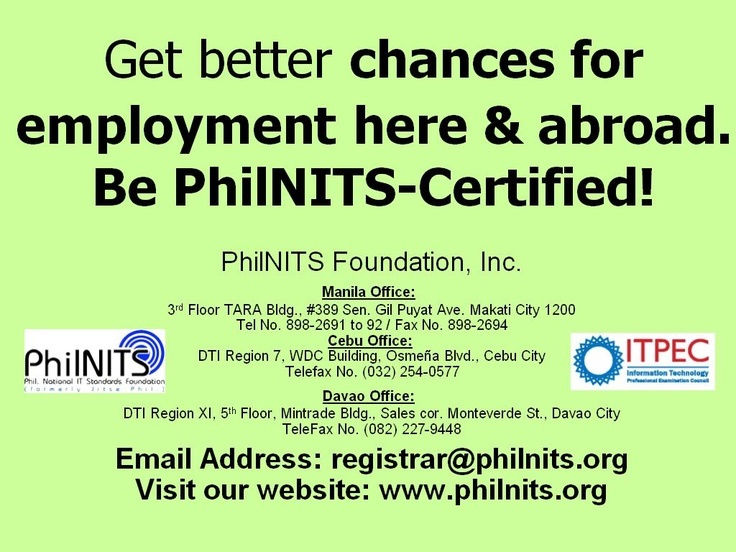 Read here for more info on How to register for PhilNITS exam, requirements and payment process. DTI region XI, 5th Floor Mintrade Bldg. The Philippine National IT Standards (PhilNITS) Foundation is a non-stock, non-profit, non government organization that is implementing the following Certification Exams for IT and non-IT Professionals who want to work in JAPAN or Japanese IT firm based in the Philippines. 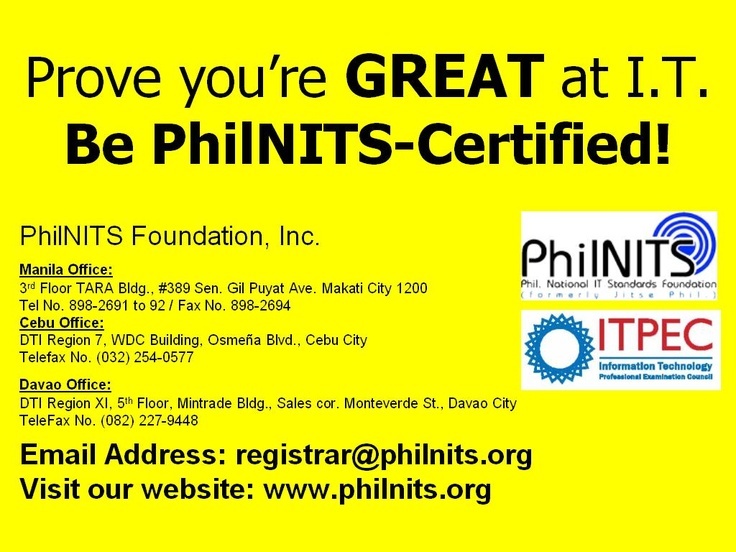 PhilNITS is currently affiliated with tech giants industry such as METI, JITEC,NEC,EPSON, Canon, Kyocera, Morson, J-SYS and last but the least, MICROSOFT. Strategically a partner of DTI and CHED as well.